How to Buy Xiaomi Stock in the U.S.
Xiaomi (小米) is an interesting Chinese company sitting at the intersection of tech and lifestyle. You may not have heard of Xiaomi, but you’ve probably seen its Apple-esque products, even here in the U.S. For example, did you know that the scooter startups Bird is just Xiaomi-as-a-service? Bird slaps its logos on scooters made by Ninebot, one of Xiaomi’s constellation of vendor-investments. I wanted to buy some shares because I believe its value is misunderstood, and its price was up to 25% below IPO. I spent a bunch of time looking into the best way of buying this international stock in the U.S. I think you’ll find my learnings useful if you’d also like to buy. Summary: buy XIACY just like you would with any other stock. ADRs represent a foreign stock in the U.S. They sound fancy but they trade just like regular stocks. The Xiaomi ADR you want is XIACY. This is simplest way to buy Xiaomi. It’s also the cheapest in terms of fees. Your broker likely offers ADRs, but they may not offer XIACY. This is the case for Robinhood, a broker known for its no-fee trading. Trading fees on ADRs are the same as U.S. stocks, and you don’t have to worry about currency conversion. You’ll see why this matters when we talk about buying shares directly in Hong Kong. We will dive deeper into the Xiaomi ADRs later in this article. Volkswagen stopped officially sponsoring this ADR. Convert the ADRs to a new unsponsored ADR VWAPY based on the value at the time of termination. “Unsponsored” means the bank believes there’s still demand for Volkswagen’s stock in the U.S. and is willing to buy a bunch to sell them to you without Volkswagen’s involvement. They’ll even waive the termination fees. Do nothing. The bank will sell the underlying Volkswagen stock. You then have to request the money. You’ll have to pay termination fees, but they seem reasonable for the access to international stocks you get. I chose to convert and it took 4 days. Good news is that your broker will take care it for you - just call them and tell them what you’d like to do. You don’t even need to fill out the conversion form. This method is easier than you think, but also costs more than you think. The biggest problem is currency exchange fees. Unless you already own Hong Kong Dollars (HKD) and your broker offers multi-currency deposits, you’ll spend 0.3% to 1% of your trade’s dollar value to convert from USD to HKD. This will be the bulk of your fees. For brokerage accounts, you can serf-serve. All I had to do was to call their trading department to enable international trading. It took 5 minutes and it’s free to enable. The fees are laid out here. For retirement accounts and cash management accounts (like a checking account), you must call in to place an international trade. Trading fees are higher, but currency exchange fees are lower. Because trading fees are fixed and currency exchange fees are a percentage of your trade, the higher dollar value of your trade, the cheaper this option is. Robinhood doesn’t support international trading currently. There are no funds with significant holdings in Xiaomi. This strategy doesn’t work if you just want to own Xiaomi. If you want to own Xiaomi’s sector, region, or recent IPOs instead, your options are limited to FPXI First Trust International IPO ETF and IPOS Renaissance International IPO ETF. Only 2% ~ 4% of their holdings are in Xiaomi. There’s a complete list of funds with Xiaomi holdings on Morningstar here. Go to the Ownership tab, then select Concentrated / Funds. If you’re buying $5,000 worth of Xiaomi stocks, and sell them after stocks go up 50% later, buying ADRs will cost you about 7% of your profit in fees. Buying international stocks starts to make sense when you buy more than $13,000 worth. Keep in mind your broker’s fees may be quite different than the Fidelity example I’m using here. For the exact math, I laid it out in this Google Sheet. You can make a copy of it and tweak it for your scenario. I know you didn’t get enough of the wonderful world of international stocks, so here’s everything you’d want to know about the Xiaomi ADRs. If you searched for Xiaomi ADRs, you’ve inevitably come across both XIACF and XIACY. What’s the difference? You cannot trade XIACF as a retail investor because it’s a “privately placed” ADR under SEC Rule 144A. This means that they’re for qualified institutional buyers (QIBs) only. QIBs want and contribute to the 25x higher average trading volume than XIACY. Volume ensures there are enough buyers and sellers to trade with you. Information and services are also limited to QIBs. 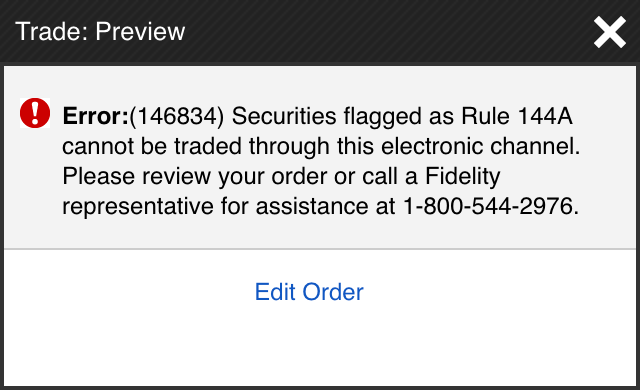 Try to buy XIACF with a retail brokerage account and you will hit a Rule 144A wall like this one in Fidelity. 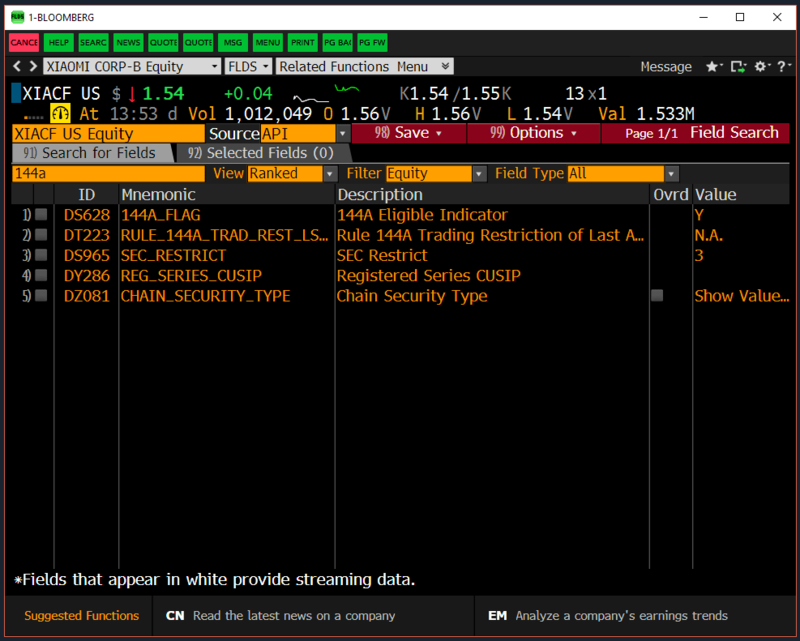 If you have access to a Bloomberg Terminal, you can pull the 144A flag in bulk with Excel: =BDP("XIACF US Equity","144A_FLAG") Weirdly, no Bloomberg Terminal functions and screens show the 144A flag besides FLDS. Bloomberg Terminal FLDS function showing the 144a_flag value for XIACF. XIACY is an unsponsored Level I ADR. For Main Street investors like you, just know that this means even though XIACY trades like a stock, it is not bound to the same level of SEC and stock exchange requirements, which are used to protect investors and signal well-run companies. “Unsponsored” means a bank bought a bunch of shares directly to sell to you to earn a fee. It is not “sponsored” by Xiaomi. “Level I” means this ADR is not used to raise capital for Xiaomi, and not subject to SEC’s reporting requirements. Xiaomi or the bank does not provide a prospectus or reporting according to U.S. GAAP accounting rules, but you can read Xiaomi’s local filings in English here. Most ADRs are Level I. Being an unsponsored Level I ADR prevents certain Wall Street investors from investing, which contributes to XIACY’s lower trading volume. XIACY’s underlying stock is Xiaomi’s class B stock traded on the Hong Kong Stock Exchange. The ratio is Ratio: 1:5, which means every share of XIACY represents 5 shares of Xiaomi stock. Xiaomi is the first to take advantage of Hong Kong’s new dual class option, offering less voting power for class B share holders. Sometimes XIACY trades in the U.S. at a premium or a discount to Xiaomi stock in Hong Kong. This is explained by how investors in two markets value Xiaomi differently. An investor might pay a premium for the ADR because she thinks it’s less risky than trading in Hong Kong. A foreign country could restrict the number of shares that can be owned by foreigners, driving the price up. Taiwan’s significant restrictions on foreign stock ownership and on the size of ADR programs drive a persistent 4% premium on the computer chip maker TSMC’s ADRs. You can find additional ADR details at this BNY Mellon website. Together with Deutsch Bank’s website, they’re my go-to public resources for ADR research. There are also the good ‘ol SEC filings. Scary disclosure: I write about things I may invest in. You should also do your own research before investing.